Stephanie Zhou hit a nerve last year when the then Faculty of Medicine student wrote an opinion article in the Journal of the American Medical Association (JAMA) called “Underprivilege as Privilege.” She wrote that she grew up in poverty – and hid her identity to feel included at medical school. “I studied hard and worked two part-time jobs during university to fund my medical school applications, but throughout the whole process, it was clear that one had to come from privilege to easily apply and assimilate into the medical culture," Zhou wrote in the essay that was reprinted in the Toronto Star. But, she wrote, she realized she “did fit into medicine” when she left the classroom and saw patients who shared her socioeconomic background. 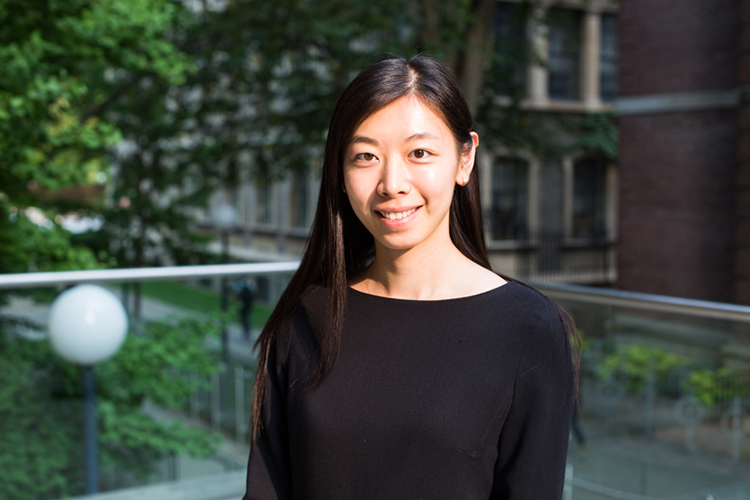 More than a year after her essay appeared in JAMA, Zhou spoke with Faculty of Medicine writer Carolyn Morris about the overwhelming response she received and her biggest takeaways. What was it about your story that seemed to resonate the most with people? I was surprised at how many people got in touch to tell me they’d been in a similar situation in medical school. It can be hard to see someone’s socioeconomic status, so it’s something that’s easy to hide. Most people who go into medical school are from well-off families – so your classmates have very different spending habits than what you’re used to. I heard a lot of stories of people hiding their backgrounds in an attempt to fit in – whether they felt like an outsider because of socioeconomic status, or having come in with an unconventional undergraduate degree, instead of sciences. Now that you’re a resident, have you had experiences where your socioeconomic background has helped you understand your patients? Now that I’m in practice, I definitely find it’s helpful. I’ve been doing my family medicine residency at Sunnybrook Health Sciences Centre, and in my emergency medicine block I’ve seen a lot of people come into the ER instead of going to a family doctor, because they don’t have one. I’ve been able to help them go about finding a regular family physician, and talking to them about why it’s important. I’ve also had conversations about nutrition and how to go about getting healthy foods cheaply. If you’ve had family members who’ve dealt with everything that comes along with financial stress, you’ll remember just how hard it can be. Just like I wrote in the JAMA article, I fit in with my patients. If you treat a patient only for chest pain, they’re not going to get better if you don’t talk about nutrition, weight, smoking, financial stress and other issues. The Faculty of Medicine is currently focusing a lot of attention on student financial support, including providing matching opportunities for donors who support bursaries. Can you speak to how funding helped you throughout your studies? Bursaries helped me a lot. Whereas I had worked several jobs during my undergraduate studies, I had only one during medical school, as a lab technician in the evenings. I never had to skip class to work and having less financial pressure meant I could spend time on doing things for career development and getting involved in the student community. It was like being at a buffet – all of a sudden I had so many options available to me in my spare time. I did a master’s degree in system leadership and innovation, got involved in the faculty’s student-run IMAGINE clinic, served as producer of the student theatre production Daffydil, and got involved in U of T Medical Society’s Pacemakers Dragon Boat Club. I could only do all of this because I was getting financial support. And the experiences were so enriching – not only to my professional development, but also being able to make a lot of friends and have such great memories of medical school. Did your JAMA article lead to any new opportunities? In addition to the many people reaching out and sharing their stories, another thing that’s come out of it is my current work with the Faculty of Medicine’s diversity mentorship program. I’m involved in a research project focused on how to improve the program for equity-seeking groups, especially around those factors that might not be easy to see, including socioeconomic status, religion or sexual orientation. We’re looking at ways to guide mentors and mentees through what can sometimes be awkward or sensitive conversations to begin about diversity issues. I have a little over a year left in my family medicine residency. I’m also interested in addictions medicine and working with homeless populations. I had the opportunity to do an addictions medicine practicum at the Boston Health Care for the Homeless Program as part of my master’s degree, and I think there’s a real need for this type of care here in Canada.